A favorite insulated boot cover choice for use on Denali, Himalayas, and Polar expeditions. Patterned to fit double plastic mountaineering boots. 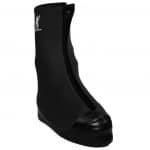 It is a very unique overboot in that it can stretch to fit easily over a wide range of double shelled mountaineering boots. Made in The USA! Sizing is based on Boot Sole Length (BSL): Measure the complete length of your boot sole from toe to heel with a ruler.